Riot policemen stand guard as the right-wing supporters protest after a German man was stabbed last weekend in Chemnitz, Germany, Aug. 27, 2018. 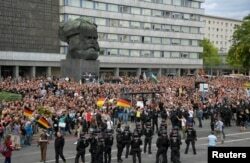 German officials are blaming "fake news" peddled on social media sites for helping to stoke rioting this week in the eastern city of Chemnitz, following the murder of a 35-year-old German man, allegedly by asylum-seekers from Iraq and Syria. “We have to acknowledge that mobilization on the internet was stronger than in the past,” said Michael Kretschmer, the state prime minister of Saxony, where the mainly right-wing violence erupted. The trouble was fueled partially by false claims the now-deceased man, identified as Daniel Hillig, had intervened to protect a woman from the asylum-seekers. There were also rumors on social media that a second German was killed. Demonstrators hold banners during a protest in Cologne, Germany, Aug. 28, 2018. 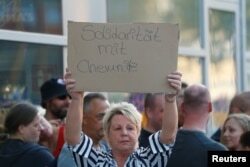 The banner reads, "Solidarity with Chemnitz." The prime minister said the rioting “was based on xenophobic comments, false information and conspiracy theories.” He added, “It was based on fake news.” Officials say trying to combat false stories adds to the spread of rumors: denials help their dissemination. A variety of far-right groups spread the false claims in the face of police denials. Hillig was fatally stabbed during a fight in Chemnitz in the early hours of Sunday as a street festival came to a close, according to police. A Syrian and an Iraqi were arrested on suspicion of manslaughter. Police say the anti-migrant protests that broke out in the hours after Hillig's death were initially spontaneous and featured about 800 people. But by late Monday, the crowd had swelled dramatically. Right-wing supporters protest against foreigners after a German man was stabbed last weekend in Chemnitz, Germany, Aug. 27, 2018. Police were unable to disperse more than 5,000 far-right protesters. Law enforcement deployed water cannon and fired tear gas canisters to little avail. The protesters, some of them self-styled neo-Nazis, retaliated by hurling bottles and pelting police lines with any heavy objects they could get their hands on, say witnesses and officials. The rioting was the worst since 1992, when an anti-migrant mob assaulted and firebombed an apartment block housing refugees and migrants in the city of Rostock. In a statement, police said two police officers, nine far-right protesters and nine counter-protesters were injured in the recent clashes. About 1,000 counter-protesters gathered Monday, complicating the situation for the 591 police officers deployed. Germany’s Interior Minister offered Chemnitz federal security assistance in the event clashes are repeated. Chemnitz was a base of the neo-Nazi National Socialist Underground, which 2000 and 2007 was blamed for several murders, most of them Turkish migrants. FILE - German chancellor Angela Merkel gestures during a discussion with TRUMPF employees in Neukirch, eastern Germany, Aug. 16, 2018. Josef Schuster, president of the Central Council of Jews in Germany, said a shocking number of people apparently felt no inhibitions on “hunting down certain groups and calling for vigilante justice.” He told the German press agency the targeting of migrants was becoming common. Officials acknowledge they were taken aback by the speed with which the anti-migrant protesters were reinforced. Saxony's interior minister, Roland Wöller, told media that known soccer hooligan groups helped mobilize people from across Germany and transport them to join the street battle. Local officials say about a dozen protesters are under investigation for giving the extended right arm Nazi salute, an illegal act in Germany. According to the head of the police union GdP, Oliver Malchow, the government has to bear some of the blame for the rioting, pointing to staffing cuts. 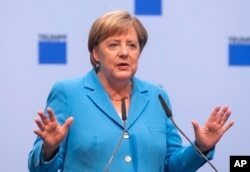 In an interview with the German newspaper Neue Osnabrücker Zeitung, he said the police across the country are ill-prepared to confront far-right groups. “The state has failed when is comes to domestic security because it massively reduced staff numbers.” He said at least 20,000 more police are needed. “When the state is perceived as no longer able to protect citizens, citizens take the law into their own hands and start to rely on self-defense militias and vigilantism,” he warned. 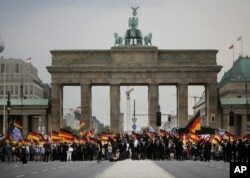 FILE - AfD supporters wave flags in front of the Brandenburg Gate in Berlin, Germany, May 27, 2018. The AfD swept into Parliament last year on a wave of anti-migrant sentiment. “The problem isn’t the peaceful protests by the brave people of Chemnitz against criminal Muslim migrants, it is the rapes and murders by illegal immigrants, migrant violence,” tweeted AfD lawmaker Udo Hemmelgarn. As the rioting unfolded, another AfD lawmaker, Markus Frohnmaier, tweeted, “If the state is no longer able to protect its citizens, people go onto the street and protect themselves. It's quite simple,” he said. "It's a citizen's duty today to stop death-dealing 'knife migration.' It could have been your father, son or brother,” he added.